(1) ‘The King of Beats’ commemorative booklet contains interviews with his peers, scholars, etc. along with rare and never before seen photos with provocative insight and perspective of the early years of Jay Dee’s career. 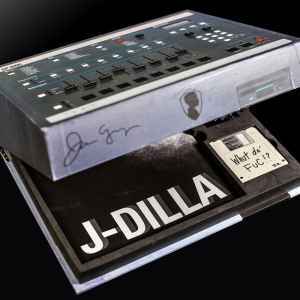 (1) Limited Edition 3.5 inch floppy disk containing an unreleased J Dilla production, multi-tracked and formatted specifically to upload within the actual E-Mu SP-1200 machine. The box casing is hand crafted from custom wood with chrome hinges.